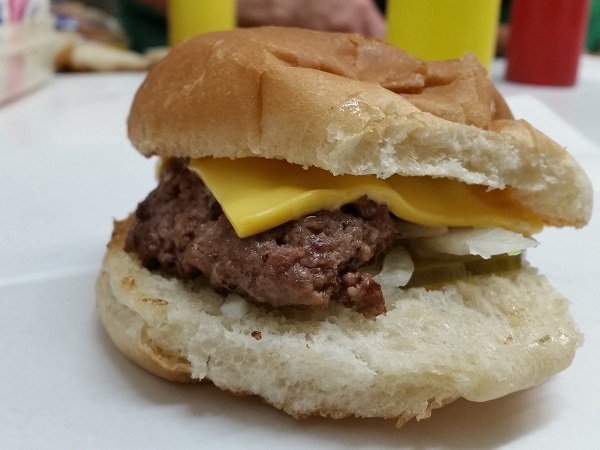 Ferrell’s Hamburgers, Hopkinsville KY – Marie, Let's Eat! On the Friday of our trip, our friend Louis had been telling us about a chain of burger places that used to have multiple locations throughout western Kentucky. He said that Ferrell’s had once been a very special place. They had an outlet in his hometown, Henderson, along with multiple stores in Owensboro and Bowling Green. These days, they were down from perhaps a dozen stores to just three, in the towns of Cadiz, Hopkinsville, and Madisonville, and he believed that the survivors were nowhere as good as the Henderson store once was. 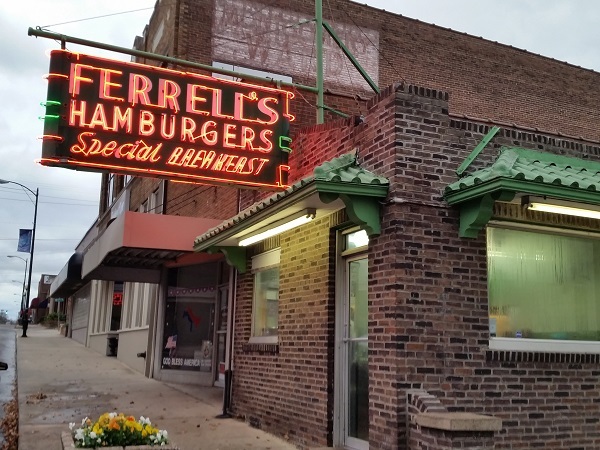 This was an especially bizarre coincidence, as I had only shared my itinerary with Louis for the eight restaurants we planned to visit in his neck of the woods, and he couldn’t have known that we were planning to stop by the Ferrell’s in Hopkinsville after leaving Waverly on Saturday. I thanked him for the heads-up, but as it turned out, the Ferrell’s in Hopkinsville was very good and I enjoyed it tremendously. If these burgers are nowhere as good as what the one in Henderson’s once offered, then the planet has truly lost something amazing. Then again, our picky four year-old didn’t like his very much. 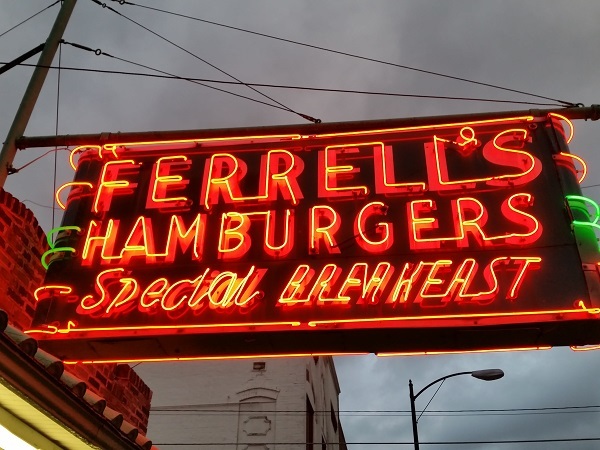 The first Ferrell’s opened in 1929, and if I understand correctly, the chain was passed to several sons who maintained it for several decades. Unfortunately, as the nice older lady who grilled our burgers explained, as the sons died, their wives did not keep the restaurants going. The three surviving Ferrell’s are owned by the widow of the last son, the only one who had an interest in keeping the businesses going. “And she’s 90!” she exclaimed with a smile. We left Peak Brothers in Waverly about two hours behind schedule and only made up about five minutes on the road. Rather than backtracking from Waverly to KY-138, the Pennyrile Parkway, I had chosen to take back roads, including US-41 ALT and KY-109, through Dixon to I-69 and then south on Pennyrile, because seeing the beautiful countryside and rolling hills was more important, and I didn’t have many chances to get a good head of speed on these small roads. I also had a twinge of hope that we’d stumble on some old, forgotten, and amazing restaurant along the way, but we didn’t see a thing; the region is far too sparsely populated for that. We did see a billboard for Brothers BBQ in Madisonville, but, for anybody considering a trip to Kentucky for its specialties, their online menu shows that they are too far south from the mutton region to carry this meat. We got to Hopkinsville, which is a completely gorgeous town of about 30,000 with a great old downtown area, shortly before sunset and took three of the six stools at the counter. Ferrell’s does a lot of carry-out business, with people phoning in great big orders and arriving to collect bulging sacks. 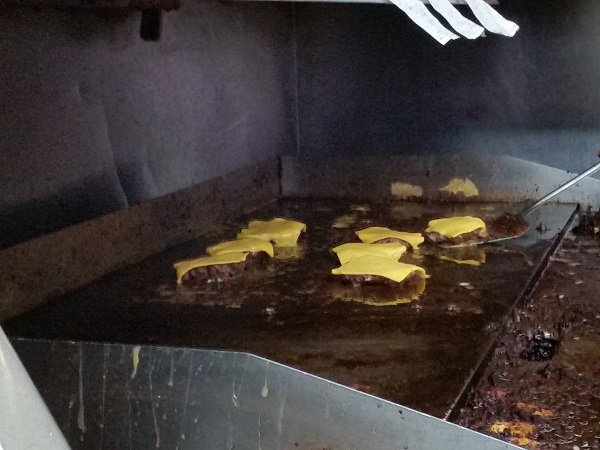 The burgers are grilled on a flat top and they smell almost as good as they taste. 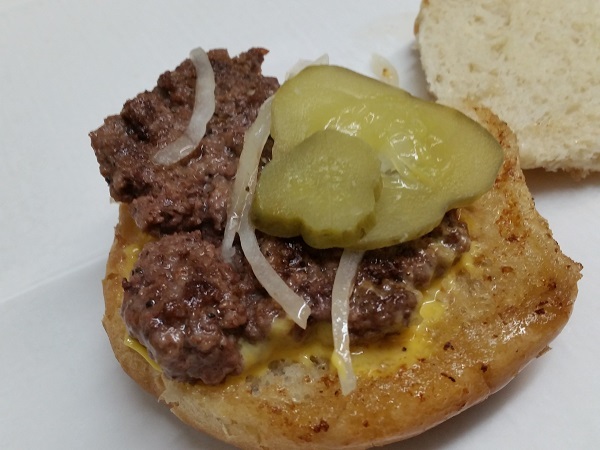 They’re small, about like sliders, and dressed with pickles, mustard, and onions. The servers were incredibly sweet, and the locals smiled at my son’s goofball antics. Unfortunately, he’s still learning to be polite when he does not care for something, but the staff took it in stride. After all, I liked the burger enough for both of us. I told them that I read about the restaurant at Chopped Onion. That site has steered me wrong exactly twice; I’m confident there won’t be a third time. We left after a very, very short visit, even shorter than the usual dash-n-runs that I’m known to make on the road, but were still almost ninety minutes behind schedule. As we moved further south and darkness fell, keeping appointments in Nashville and Chattanooga was made impossible by a major accident that shut down the eastern lanes of I-24 and sent us on a long detour around Clarkesville. We skipped the first stop to save a little time, and rushed through the Russell Stover outlet in Manchester for Marie to grab sweets, but conceded defeat and passed on the planned stop at a Chattanooga restaurant so that we could at least get home before ten. I’m still a little bummed that we didn’t visit Edley’s in Nashville like I had hoped, but we were back in Chattanooga eight days later to pick up our daughter, and we made it to that restaurant, just a little later than planned! It was a very good trip. More hobbyists and food writers from our neck of the woods should head up to western Kentucky and Evansville. I hope that we’ll return sometime and sample some more places in the region one day, too. Posted on January 8, 2016 August 24, 2017 by Grant G.Posted in burgers, kentucky, regional chainsTagged burgers, hopkinsville, kentucky, regional chains. I’ve been reading your blog (maybe for the 2nd or 3rd time) of when you came to Henderson and Evansville and I showed you around. I just wanted to let you know that last September (2016) I found a barbecue restaurant for you to try in Madisonville, Kentucky called Dave’s Sticky Pig. The ribs are to die for! Most of the sides are very good too–way much better than the usual bland, ersatz sides you find in most barbecue places. You remember how picky I can be, and this place surpassed my expectations. I’ve taken several people here over the course of a year now, and they have concurred with my find. The only fault that I can find with the barbecued ribs is that they aren’t as good when you get them to go. Something gets lost in the 30 minutes it takes to drive home; so eat them there at the restaurant. And one more thing: Don’t eat the mutton. These people know absolutely nothing about how to prepare mutton. If you want mutton, go to Peak Bros. The mutton was so bad here that the only reason I swallowed it was because they didn’t supply a barf bag with the sample. It was bad. Anyway, I hope you get up this way again before too long. I am pretty sure Farreall Bros. Originated in Henderson, Ky…. my dad told us this….. please let me know… thank you.